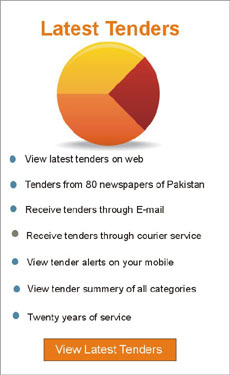 Tender Service provides latest tenders,online tenders and tender alerts from Pakistan. Tender Service searches all the major Newspapers and notifies you of tenders, quotes, expressions,prequalifications,from Pakistan. Become a free member of Tender Service to view tenders summary or become a paid member of Tender Service to view complete tender image on email and web. Free tender summary of your required category.You can access to free summery of the latest tenders according to your required category,department,date of publishing and date of opening of tender. You can read free articles and news on tender management. Latest tenders are delivered to you everyday - by courier or email or SMS tender alert on your mobile and you can also access our web site from any where any time to keep yourself updated with the latest tenders.Please note , tender details and tender image is only available to the paid members.Join now to enjoy the facilities offered to our paid members.